After introducing The Gardeners it is only appropriate that I show you our winter companions, the Frost Family. I was never really a wreath person. We never had one in my childhood. However, when I made The Gardeners I fell in love with the concept. I wanted to have a wreath to adorn our door all the time. To make us smile, chuckle when we come home each day. So I set out to search the net for something that would inspire me. 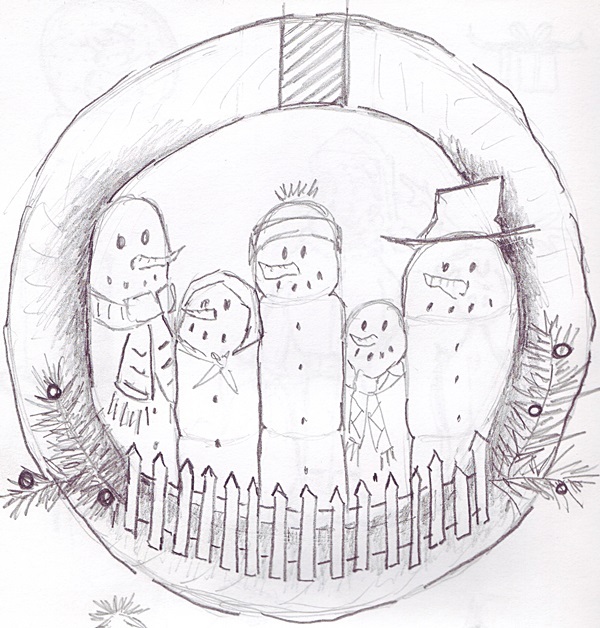 Something that had a winter theme, but not linked to any holiday in particular. I ended up falling in love with one in particular that I found on SnowmanCollector’s etsy shop. It was already an out of stock product so decided to remake it to my taste. I quickly made a sketch. The family members’ body is made from white felt. Rectangular shapes were sewn together and stuffed with cotton wool. I simply glued the black beads onto the felt to make for the eyes mouth and buttons. The noses are pieces of orange felt that were rolled into cone shape and then glued onto the body. The hat, the top hat the scarves and the head scarf are made from different scraps of leftover felt. The hair of the scruffy looking snowman is just thread that was sewn on and cut to shape. I opted for a brown fence. Pieces of brown rubber were cut to shape and glued onto a ribbon. I ended up stitching it later to make it more secure. 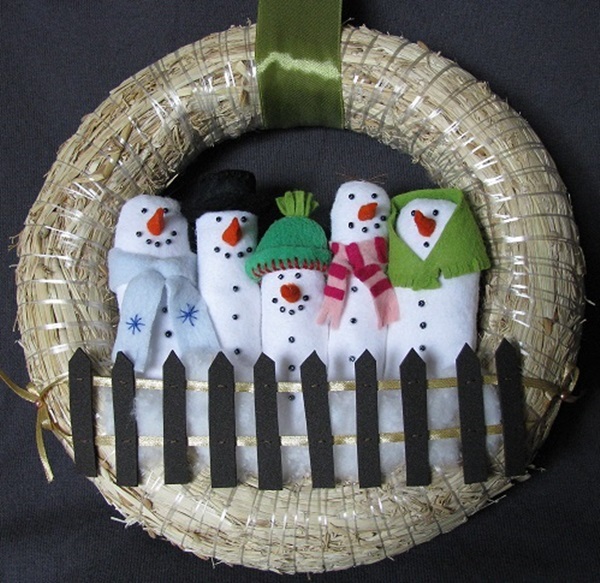 I stuffed a little cotton wool between the fence and the snowmen to make it look like snow. And here they are, our Family Frost!